COLOUR is defined to be a property inherent in light, whereby, according to the different sizes or magnitudes of its parts, it excites different vibrations in the fibres of the optic nerve, which being propagated to the sensorium, affects the mind with different sensations. Or it is defined to be a sensation of the soul, excited by the application of light to the retina of the eye, and different as that light differs in the degree of its restangibility, and the magnitude of its component parts. So that in the former view, light is the subject of Colour, and in the latter it is the agent. The opinions of authors, both antient and modern, have been various, with respect to the nature and origin of the phaenomenon of Colour. The most popular opinion is that of the followers of Aristotle, who maintain'd that colour was a quality residing in the colour’d body, and that it does exist independently of light. The Cartesians came indeed something nearer to the truth, who owned, that as the colour'd body is not immediately apply'd to the organ, to occasion the sensation, and that as no body can affect the sense but by immediate contact the colour’d bo dy does not excite the sensation of it self, or contribute any thing to it, otherwise than by moving some interpos'd medium, and by that the organ of light. They add, that as we find that bodies don't affect the sense in the dark, light only occasions the sense of Colour, by moving the organ; and that colour’d bodies are no further concern'd, than as they reflect the light with a certain modification; the differences in their colours arising from a difference in the texture of their parts, whereby they are dispos'd to reflect the light with this or that modification. But 'tis to the incomparable sir Isaac Newton we owe a solid and consistent theory of colours, built on some experiments, and solving all the phaenomena thereof. His doctrine is as follows. It is found by experience, that rays or beams of light are compos'd of particles very heterogeneous, or dissimilar to each other, i. e. Some of them, as it is highly probable, are larger, and others less. For a ray of light, as E F (see plate fig. VI.) being receiv'd on a refractory surface, as A D in a dark place is not wholly refracted to L, but split as it were, and diffus'd into several little rays; some of which are refracted to L, and others to the other intermediate points between L and G, i. e. those particles of the light, which are the most minute, are of all others the most easily and most considerably diverted; by the action of the re fracting surface out of their rectilinear course towards L: and the rest, as each exceeds another in magnitude, so is it with more difficulty and less considerably turn'd out of its right line to the points betweeen L and G. See REFRANGIBILITY. Now each ray of light, as it differs from another in its degree of refrangibility, so does it differ from it in Colour; this is war ranted by numerous experiments. Those particles v. g. which are most refracted, are found to constitute a ray of a violet colour, i. e. in all probability, the most minute particles of light, thus separately impell’d, excite the shortest vibrations in the retina, which are thence propagated by the solid fibres of the optic nerves into the brain, there to excite the sensation of violet colour; as being the most dusky and languid of all Colours. See VIOLET. Again those particles which are the least refracted, constitute a radiolus or ray of a red Colour, i. e. the largest particles of light excite the longest vibrations in the retina, so as to excite the sensation of a red Colour, the brightest and most vivid of all Colours. See RED. The other particles being in like manner separated according to their respective magnitudes into little rays, excite the inter mediate vibrations; and thus occasion the sensation of the inter mediate colours, much in the same manner as the several vibrations of the air according to their respective magnitudes, excite the sensation of different sounds. To this it may be added, that not only the more distinct and notable Colours of red, yellow, blue, &c. have thus their rise from the different magnitudes and refiangibility of the rays; but alo the intermediate degrees or teints of the same colour, as of yellow up to green, of red down to yellow, &c.
Further, the Colours of these little rays not being any adventitious modifications thereof, but connate, primitive and necessary properties, as consisting in all probability, in the magnitudes of their parts, must be perpetual and immutable, i e. cannot be changed by any future refraction or reflection, or by any modification whatsoever. This is confirm'd by abundance of experiments; all endcavours having been used, after separating a colour'd ray from those of other kinds, to change it into some other Colour by repeated refractions, but to no effect. Apparent transmutations of Colours indeed may be effected, viz. where there is an assemblage or mixture of rays of different kinds, the component colours never appearing in their natural hue in such mixtures; but always allay’d and temper'd with each other; whence results a middling kind of colour, which by refraction may be separated into component ones; and those after separation being remix'd, return to their former colour. Hence the transmutations of Colours, by mixing those of different kinds, are not real; but mere appearances and deceptions of the sight: for the rays being again severed, exhibit the same colours as at first. Thus blue and yellow powders well mixt, appear to the naked eye green; yet without having pass'd any alteration, when view'd through a microscope, the blue and yellow particles still appear distinct. Hence there arise two kinds of colours, the one original and simple, produc’d by homogeneal light, or by rays that have the fame degree of refrangibility, and the same magnitude of their parts; such as red, yellow, green, blue, a violet, purple, orange, and indigo, with all their intermediate teints and gradations. The other kind of Colours is secondary or heterogeneous, com pounded of the primary ones; or of a mixture of rays differently refrangible, &c.
There may also be secondary colours, produc’d by composition like the primary ones, or those consisting of homogeneal light, as to the species or appearance of the Colour; but not as to the permanency or immutability thereof. Thus yellow and blue make green; red and yellow, orange; orange and yellowish green, yellow; and in the general, if any two Colours be mix’d, which in the series of those generated by the prism, are not too far apart from their mixture, results that colour, which in the said series is found in the mid way between them; but those situated at too great a distance, do not so. Indeed, the more any Colour is compounded, the less perfect and vivid it is; by too much composition, they may be diluted and weakened, till they cease. By composition, there may be produced Colours, not unlike any of those of the homogeneal light. The most extraordinary composition is that of whiteness, for to this, all the primary colours abovementioned are required; and those to be mixt in a certain degree. Hence it is that white is the ordinary colour of light; light being nothing else but a confus'd assemblage of rays of all Colours. If the rays of different Colours do thus begin to be separated by one refraction of one single surface, that separation is much promoted, so as even to become senfible to the eye by a double refraction. This is observ’d in the two surfaces of any glass; provided those surfaces, be not parallel, but of all others, it is most sensible in the two faces of a triangular prism; the phaenomena whereof, as they are the touchstone of all theories of Colours, and as they contain the theory of that is here delivered, we shall lay down as follows. 1. The rays of the sun, transmitted through a triangular prism, exhibit an image of various Colours (the chief of which are red, yellow, green, blue and violet) on the opposite wall. 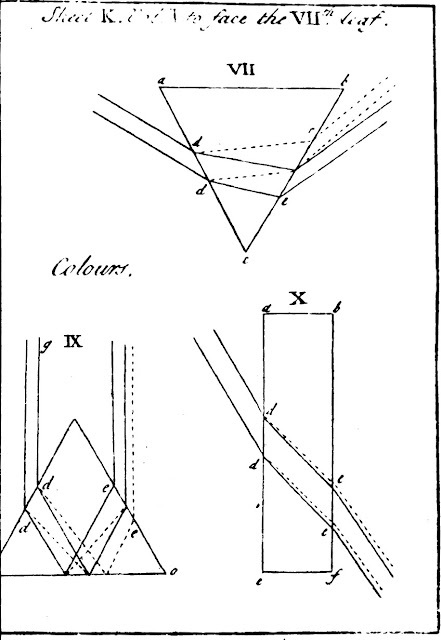 The reason is, that the differently colour'd rays are separated by refraction; for the blue rays v. g. mark'd with the dotted line (see plate fig. VII.) which begin to be separated from the rest, by the first refraction in d d of the side ca of the prism a b c (as also in the first surface of the globe of water a b c, fig. VIII.) are still further separated in the other side of the prism b c, (as also in their egress out of the globe a b c) by a second refraction in c e, in the same direction as the former: whereas on the contrary, in the plane glass e bef, fig. X. (as also in the prism g l o, fig. IX. now plac'd in another situation) those blue rays which begin to be separated from the rest in the first surface in d d by a second refraction, the contrary way pass out parallel, i.e. remix'd with all the colours of the other rays. 2. That image is not round, but oblong; its length, when the prism is an angle of sixty or sixty five degrees, being five times its breadth. The reason is, that some of the rays are refracted more than others; and by that means exhibit several images of the sun extended lengthwise, instead of one. 3. Those rays which exhibit yellow, are turn'd further from the rectilinear course, than those which exhibit red, those which exhibit green, than those which exhibit yellow; but of all others, those which exhibit violet the most. 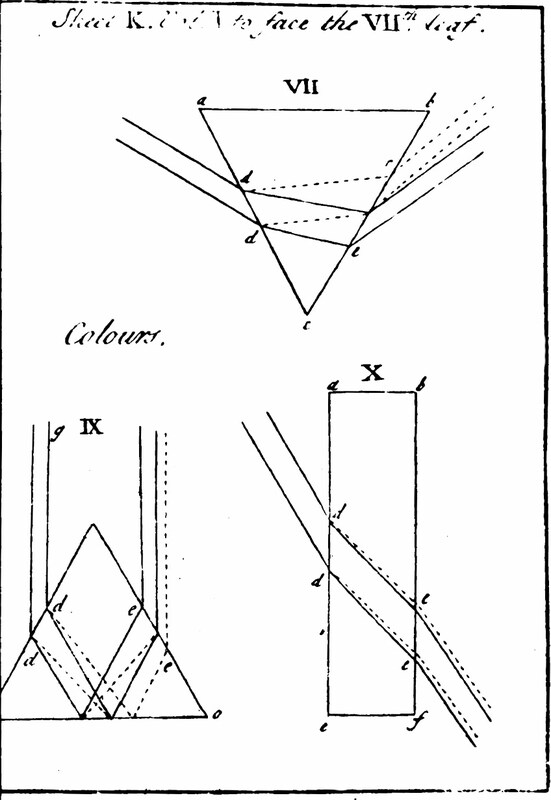 Accordingly, if the prism, thro' which the light is transmitted, be turn’d about its axis, so as the red, yellow, green, &c. rays be projected in order, thro' a narrow aperture into another prism, plac'd at the distance of about twelve feet; the yellow, green, &c. rays, though falling through the same aperture in the same manner, and on the same point of the second prism, will not be refracted to the same place as the red; but to a point at some distance from it, on that side to which the rotation is made. This is what sir Isaac Newton calls the experimentum crucis; being that which led him out of the difficulties into which the first phaenomenon, &c. had thrown him, and plainly shew’d a different degree of refrangibility, and a different Colour corresponding thereto in the rays of light; and that yellow rays, v. g. are more refracted than red ones, green ones more than yellow ones, and blue and violet ones most of all. 4. The Colour of colour’d rays well separated by the prism, are not at all chang'd or destroy'd by passing an illuminated medium, nor by their mutual decusation, their bordering on a deep shadow; nor their being reflected from any natural body, or refracted through any one, in a place howsoever obscure. The reason is, that Colours are not modifications arising from refraction or reflection, but immutable properties; and such as belong to the nature of the rays. 5. An assemblage of all the kinds of colour'd rays, collected either by several prisms, by a convex lens or a concave mirror, or in any other manner, from what we call whiteness; yet each of these after decussation, becoming separated again, exhi bits its proper Colour: for as the ray was white before its parts were separated by refraction; so the parts being re-mix’d, it becomes white again, and colour'd rays when they meet together, don't destroy one another, but are only interspers'd. Hence a red, green, yellow, blue and violet Colour, being mixt in a certain proportion appear whitish, i. e. are of such a Colour as arises from white and black mix'd together; and if there were not some rays absorb’d and lost, would be plainly white. In like manner, if a paper cut into a circle, be stain'd with each of those Colours separately, and in a certain proportion; then swiftly turn’d round its centre, so that the species of colours be mixt together in the eye, by the briskness of the motion, the several Colours will disappear, and the whole paper appear of one continued Colour; which will be a mean between white and black. 6. If the rays of the sun fall very obliquely on the inner sur face of a prism, those that are reflected will be of a violet Colour; those that are transmitted red. For the rays were colour’d before any separations, and by how much they are the more refrangible, by so much they are the more easily reflected; and by that means are separated. 7. If two hollow prisms, the one being fill'd with a blue fluid, and the other with a red one be joined together; they will be opake, though each being apart will be transparent. For the one transmitting none but blue rays, and the other none but red ones, the two together will transmit none at all. 8. All natural bodies, especially white ones, view'd through a prism held to the eye, appear fimbriated or bordered on one side with red and yellow; and on the other with blue and violet. For those fimbria are the extremes of intire images which the rays of any kind, as they are more or less refracted, would exhibit nearer or at a greater distance, from the real place of the object. 9. If two prisms be so plac'd, as that the red of the one, and the purple of the other meet together in a paper fit for the purpose, incompass'd with darkness; the image will appear pale, and if view'd through a third prism, held to the eye at a proper distance, it will appear double, the one red, and the other purple. In like manner if two powders, the one perfectly red, and the other blue, red and purple be mix'd; any little body cover'd pretty deeply with this mixture, and view'd through a prism held to the eye, will exhibit a double image, the one red and the other blue; by reason that the red and purple, or blue rays are separated by their unequal refraction. 10. If the rays transmitted through a convex lens be receiv'd on a paper, before they meet in a focus; the confines or boun dary of light and shadow will appear ting'd with a red Colour; but if they be receiv'd beyond the focus, with a blue one. Because in the first case, the red rays being something more refracted, are the higher; but in the second after decusation in the focus, the blue ones. Lastly, if the rays about to pass through either side of the pupilla, be intercepted by the interposition of any opake body near the eye; the extremes of bodies plac'd, as if view'd through:* will appear ting'd with Colours, though those not very vivid. For then the rays transmitted through the rest of the pupilla, will be separated by refraction into Colours, without being diluted with the admixture of the intercepted rays, which would be re fracted in a different manner. And hence it is, that a body, view'd through a paper, pierc’d with two holes, appears double and also ting’d with Colours.